Let’s talk about bears. Think about all of the bears that were a part of our youth: Yogi, Smokey, Teddy Ruxpin, The Berensteins, Balu, Poo, Paddington, Fozzy, and the Care and gummy varieties. Holy crap that’s a lot of bears. And yet, how often do we think about bears now that we’re adults? In my case, not often at all. So when Kiera and I came across an organization that works to improve the lives of bears worldwide, we were intrigued. I mean, who wouldn’t welcome the opportunity to work with a childhood icon? Free the Bears Fund rescues bears throughout Asia and India, and has a flagship sanctuary near Phnom Penh, Cambodia. While the weekly volunteer fee was a bit outside of our budgets this late in our trip ($550/week), we opted to participate in the “bear keeper for a day” program in order to check out the good work that is being done on behalf of the bears. 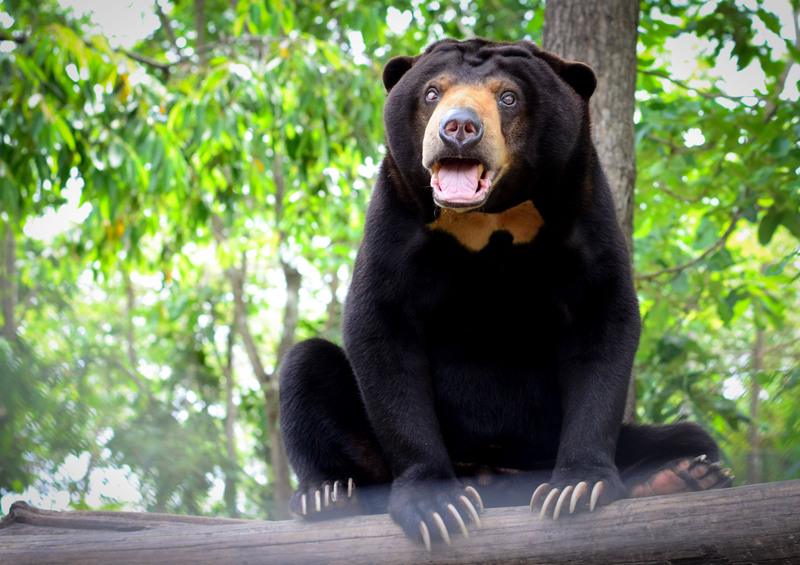 The silly gentleman pictured above is Ralph, a three-footed sun bear that exemplifies the work being done by Free the Bears. 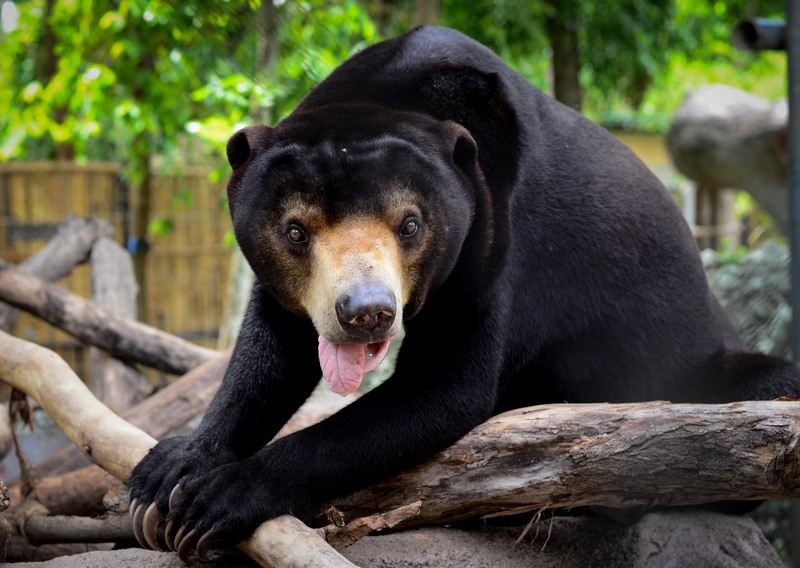 Ralph lost his back right foot to a hunter’s trap and eventually ended up in the safety of the Free the Bears sanctuary within the Phnom Tamao Wildlife Rescue Center (PTWRC). While thousands of bears throughout Asia continue to be subjected to the inhumane practices of bear bile farming, harvesting of bear body parts for food and traditional medicines, and kept as potentially dangerous pets, Ralph and his 120 Asiatic and sun bear friends at the PTWRC are living the life. They spend their days eating regularly scheduled meals, exploring their rather roomy “natural” enclosures, and participate in “scatter feeds” where bear keepers and volunteers hide food to encourage the bears’ natural foraging tendencies. The PTWRC is just far enough outside of Phnom Penh that visitors are mostly local Cambodians and Western tourists are quite the site. At one point, a group of monks tried to take my picture without my knowledge, presumably because of my fair skin and reddish hair. 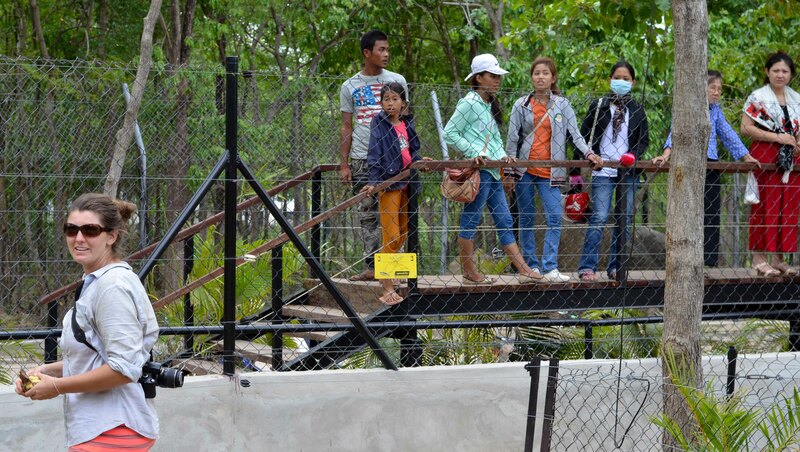 While hiding food around the enclosures as part of the scatter feed, a large crowd of Cambodians gathered to observe “the two white girls playing in the bear pen.” As soon as we stepped outside and the bears were let loose to find the goodies, the crowd dissipated. What can I say? We’re huge in Asia. Kiera and her adoring public. By the end of the day I was dirty, hot, and full of appreciation for the work being done by Free the Bears throughout Cambodia, Indonesia, Thailand, Laos, India, and Vietnam. I have even more respect for my childhood companion, “Teddy,” who not only represents her wild bretheren, but who was dragged everywhere throughout my formative years and may (or may not) have been hand-delivered by my dad to my dorm room freshman year of college. It was a transitional period—a girls gotta do what a girls gotta do. Additional information about Free the Bears and volunteer details will soon be added to the Great Organizations section.